We love, love these chairs. Ordered 10 for our dining room. We have gotten so many compliments. We ordered the gray and they look so expensive and elegant. Crusie Mushroom Dining Chairs (Set of 2) - 22" x 24.8" x 36.4"
Safavieh En Vogue Dining Lester Blue Dining Chairs (Set of 2) - 22" x 24.8" x 36.4"
Dine in style with the understated elegance of the Humphry dining chair. Beautifully transitional, this chair is the perfect complement to contemporary tables, and looks just as great in the living room. With barely there sloped arms, straight birch legs finished in espresso mahogany and mushroom taupe cotton velvet upholstery, the chic Humphry chair gets a punch of pizzazz with silver nailheads. Great fabric, great construction, comfy! We use them for our formal dining head chairs so they don't get a ton of use but they look great! The color is true to the description, a true dark taupe. Very neutral- not brown not grey. The fabric is soft and plush. We're very happy with these chairs! Purchased 1 set of the Mushroom Taupe Chairs. Love them! Comfy, with a beautiful rich colored, plush fabric, not pink or brown, a clean Mushroom Gray tone. Legs seem to be a mahogany toned wood. Zippered compartment hidden underneath the seat. 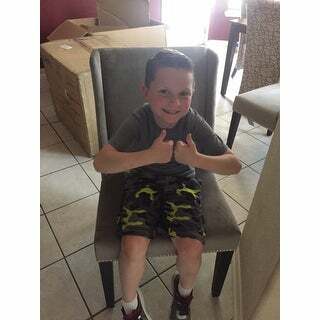 One chair arrived without all the necessary hardware to put it together, but thankfully my friend was here the day they were delivered (delivery came early, too :-), and he went to purchase what was needed, by matching up hardware from the 2nd chair. You will love this seating: certainly adds a touch of elegance to your dining area. Just got these and put them together simply. I LOVE THEM. I immediately have bought 4 more to complete the dining room. So comfortable and sturdy! The color is great to match a more neutral beige look OR a gray palette. 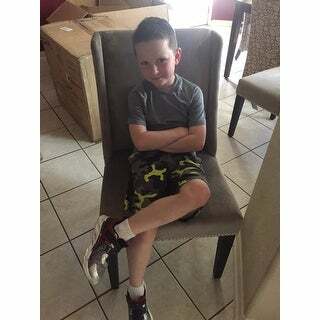 Eight year old boy added in photos for cuteness and size comparison. He did not come with the chairs. I ordered 4 of these chairs. They arrived so fast and were packaged beautifully. I don't know how you can ever go wrong with Safavieh products. There was some assembly (attaching the legs) but my husband did this in a very short period of time. These chairs are beautiful, great fabric, very good construction and the color is very close to the picture. Thanks Overstock for another great purchase! Love these chairs very classy, comfortable. They look beautiful in my formal dinning room. These chairs are stunning! The pictures don't do them justice. The color is a perfect taupe and the legs are dark espresso. Great quality for the price! These are comfortable, stylish, neutral gray chairs. The seats are larger than I expected--which was a surprise for me, but the tall men in my family appreciate the generous proportions. The quality is on par with similar options available at retailers like Pier1, if not slightly better. I ordered six chairs, and assembly was fairly straightforward--after the first chair, the others went more smoothly. One chair leg was not cut to fit the frame, and we decided to saw it down to adjust it rather than try to exchange. Overall, I'm happy with this purchase and would buy again. Love these chairs! Perfect mushroom grey color and they look much more expensive than they actually are! I started off ordering just one set to make sure I liked the color and LOVED them so I ordered two more sets. They really are more of a mushroom color than a true gray but they could easily work in a situation where someone wants gray. I had been searching a lot of stores for chairs to go with my table and am so happy I decided to give these from Overstock a try. They are well made and very comfortable. Beautiful. Good quality. Easy to put together. These chairs look better online than they do in person. The color is different and the fabric looks cheap. I really liked the style and debated whether or not to return them. There were some missing pieces which they were willing to send them. Overstock was great with picking up the chairs. "i️ can’t find the legs to the chairs????? " "I need 4 tufted parsons chairs that match these as close as possible , can you help. With pictures ? Thanks!" "Hi! I am looking for gray chairs for my dining room. Is the "mushroom taupe" a true gray color? This is difficult to tell. Thanks!!!" This item could be slightly more taupe as listed. Please note that some colors may vary due to dye lot variation from production. "What is the measurement from floor to seat? Is it 19"? or 18". thanks!!!" The seat height is approximately 20.9" inches. "HI I have a question about the fabric, is microfiber ?" Hello Monica, these are made of cotton velvet. Please let us know if you have any further questions. "it's hard to tell what kind of fabric this is- I know its says cotton but it has a brushed velvet look. Can you please describe further? Thanks!!" Thank you for contacting us stef1211. The color is mushroom taupe and the material is cotton velvet upholstery, I hope this helps. Please let us know if you have any further questions. Safavieh En Vogue Dining Lester Graphite Dining Chairs (Set of 2) - 22" x 24.8" x 36.4"
Safavieh Lester Mint Dining Chair (Set of 2) - 22" x 24.8" x 36.4"
Safavieh En Vogue Dining Morris Smoke Sloping Arm Dining Chairs (Set of 2) - 23.2" x 27.2" x 39.4"